Did Mitt Romney kill his own chances of becoming president with his reaction to the violence in Egypt and Libya? Mitt Romney may have done himself in. At the very least, the Republican candidate for president likely damaged his chances of being elected by the way he reacted to the violence in Egypt and Libya. Andrew Sullivan of The Daily Beast suggests Romney's response makes him "unfit" for the responsibility of running the country. Sullivan lays out the reasons why he thinks Romney should be disqualified from being president. Including Romney's knee-jerk judgments, based on ideology not reality, his inability to back down when he said something wrong and his argument that President Obama sympathized with the murderers of America's ambassador to Libya. Criticizing America's Commander-in-Chief while U.S. interests were still under attack, and Americans were dying, comes off as amateur and un-presidential, and might just be political suicide for Romney. It's times like these when an unguarded comment can leave a lasting impression. Compare Romney's response to how the 1980 Republican candidates for president reacted to the Iran hostage crisis under President Carter's watch. As The Atlantic points out, when news broke that an effort to rescue the American hostages from the Tehran embassy failed Ronald Reagan said, "This is the time for us as a nation and a people to stand united." George H.W. Bush went even further, saying he "unequivocally" supported carter and it wasn't a time to "try to go one-up politically." Mitt Romney has been around long enough to know better. Here’s my question to you: Did Mitt Romney kill his own chances of becoming president with his reaction to the violence in Egypt and Libya? Yes .What a "Jackwagon" (thanks for the term J.Lee Ermey). I didn't think it was possible but the idea of him with his hand on the button is scarier than Bush! Yes. Mr. Romney speaks before he thinks and that can be very dangerous. This was just another one of multiple times he has shot himself in the foot. But this may be the last one that finishes him off. If not, then god help us all if he and Ryan get into the White House. if they made a drinking game out of mitt romney's flip flops, we'd all be in rehab by now. no but when CNN NBC CBS ABC get done with it he may lose. Jack, both Obama and Romney got plenty of chances to lose the election before the vote. One blunder will not break or break either of them. A candidate doesn't kill his chances to be President with one gaffe. It's the totality of all of his gaffes that has diminished his chances to be President. That and his lack of empathy for the common man's everyday problems. In short he's been rich to long and he thinks he is entitled to a better life. Current GOP economic policies against the middle class not withstanding, Mitt Romney kills his chances to become president every time he opens his mouth. Their tax and social agendas are more important to their base/corporate overloads than coherent foreign policy. No, because he has already accomplished that by repeatedly displaying a lack of character, integrity, or fitness to be our President. His entire campaign is based on untruthful attacks on Obama, and trying to convince us that he has all the solutions to all our problems while refusing to tell us what any of those solutions are. As for his self-serving remarks on the violence in Libya and Egypt, he owes an apology to us all – politics is one thing, but trying to capitalize on the deaths of Americans is quite another – it's undignified, outrageous and despicable. Mr. Romney, here's some free advice: "Sometimes it's better to remain silent and be thought a fool, rather than open your mouth and remove all doubt". Govenor Romney's reaction to the violence in Egypt and Libya clearly shows his inexperience with foreign policy and worldly events; his refusal to disclose his Federal income taxes; his off shore accounts; his failure to reference the ongoing war in Afganistan during the republican convention but he wants us to believe that he knows what a strong America looks like; his insulting the UK during the Olympics and his flip flopping on social issues all insure that the Governor is not electable for the office of the presidency of the United States. He didn't help himself. Mr. Romney is taking a accuse first, get facts later approach that is showing signs of desperation. That may have been one of the final touches in nailing shut the coffin, but what really "bugs" me is how he tends to blow with the prevailing wind. People give him stuff to say, and he dutifully says it with not much analysis. That makes him come across as "puppet-like" and we had one of those a few years back (a la Cheney/Bush). We need a leader, not a follower. Why is it that we Americans can't see eye-to-eye on anything these days? One side says "po-tay-to" and, with not much aforethought, the other side feels they must say "pa-tot-to". It borders on the ridiculous. Anyway, from what I've seen, Romney may be a wiz at making money, but I don't think he and Ryan are ready for prime-time. I will be voting to let Obama continue with the mission of pulling us out of this fiasco. I can only hope he gets a congress that will back him. I'm really sick of the fighting. I think he did. This whole Campaing has been about Economy and Local stuff, not a word about Foreign Affairs/Policy. Now without a doubt we know that the ONLY Foreign Policy Credentials that Romney has is with the Swiss and his back accounts. Jack there are 3 things I know about people. You can't trust Liars, and thiefs, and if your word is no good, your No Good? and thats how I vote. I thought he did great. Don't you think most Americans would like to know what he would do if he were president? I really don't understand what the big deal is. Personally I think we have and I know a lot of people that are finally seeing with this election all of the media bias and I have to tell you I think it's really sad. We want the news not your personal thoughts! Mitt had his "3AM" phone call and he failed ... Miserably. But then, he's never shown any personal interest in foreign policy except where to keep his offshore money. Mitt seems to be running on "generalities", saying he's planning to cut taxes, increase defense spending, reduce the deficit, while not touching Social Security & Medicare, but won't say how. When he does say something specific, he puts his foot in his mouth...repeatedly. If you accept that at this time he had no buffer for absorbing an error, then he may have done his chances in with his ill-timed statement. I think it calls Romney's judgement into serious question. And it just reinforces the impression that he gets his facts wrong or lies, but refuses to admit it. And what's worse, Wednesday morning, after the facts became clear and that the message he was reacting to came from the Cairo embassy BEFORE the attacks began, Romney doubled-down on his incorrect assertions and didn't back down. The fact that he can't admit he made a mistake and pretends that the mistake is what he really intended all along is a really bad characteristic in a President. That kind of thing is how you end up in Iraq and wind up staying there for 10 years. Yes he did. He chose politics over logic. He blew his own chances. Mitt Romney's strategy to criticize President Obama on every issue regardless of the merits of the criticism is clear evidence that he is not ready for the office of the president where the country and the world expect solutions and not just criticism without substantive alternatives. Romney nor his 5 sons ever served this country in the military . He said once that they served by helping him in his campaign. He doesn't know what serve means does he. The left sees this as a rash, politically motivated reaction that highlights Romney's questionable decision making skills and the right spins this as a sign of strength and hard talk in contrast to a weak President. I don't see this changing anything as it just reinforces what both sides have been saying all along. Mitt didn't kill his chances but he sure didn't help his cause. This may actually help us get him off his "leadership" high horse and force him to give us specifics. Like how, specifically, he plans to improve our economy and debt. That would be nice wouldn't it Jack? No Mitt Romney did not hurt chances because he never had one with his flip flopping he was own worst enemy. Yes. As a president hopeful, you need to analysis the situation, assess the damage, offer sympathy to the family & loved ones, realize why it happened and how to prevent it, make a plan of actions than quickly & bluntly criticizing your own president. Whose side are you on? Your country or enemy? Jack " Romneys comments on 9/11 made me sick. This man does not know when to keep his mouth shut. He is not ready to be P.O.T.U.S. and never will be !!!!! He didn't stand a chance anyway. Do you want another war? Would he send his kids to fight? Would any member a congress send their own kids to fight? The answer is, Hell No!! What Pres. Obama is doing is the correct course of action. It's really too bad Obama didn't run for president instead of Bush II. Perhaps we would all be in a better place, instead of out-of-work.......and broke! Romney is way out of line. There is only one President of the United States and he isn't it! That ship sailed long before Romney opened his mouth about the violence in Egypt and Libya. People have a short attention span of that i am certain but some thing's stink so badly that you can't just bury them in the cat box and walk away. Romney should have stuck with the economy and not let up on it but instead he tried to snipe Obama on foreign policy which he has no real experience in. This shows his naivety on world issues. Ir seems that most Americans are still asleep and it's difficult to tell how many have allowed the implications of MR's latest international blunder to enter their consciousness. When in a lower state of consciousness, most decisions will be based only on "fear factor" and this is what most political advertising is aimed at. The outcome of the election will be based on who is feared the least. I sincerely hope so. His remarks were ill-considered and inappropriate given the circumstances. We have had more than enough of shoot from the lip presidents. We desperately need a thoughtful president like Mr. Obama in this complex world that we have to deal with. If this doesn't do it nothing will, except possibly the leak of his tax returns which will show the American people how little he has paid versus his income all these years. The sad part is there are people who will defend this guy no matter what kind of liar or buffoon he proves himself to be. Romney clearly showed that he doesn't have the character or wisdom to be a leader when it comes to foreign policy. The attempt to score cheap points, the hiring of Bush advisors, and the smirk on his face while Americans died prove this loud and clear. Will people too blinded by partisan rage or economic fears catch on to this? I'm not sure, but I certainly have. I'd say that it nicely ices the cake for the middle majority voters voting for him. It's like "The fundamentals of the economy are strong" back in 2008. I know I'm not comfortable with a President who reacts before they actually have the facts; but his campaign said they weren't going let the fact checkers run his campaign. That's the kind of actions that led us into a war we shouldn't have started during the Bush Admin. Add to it the the fact he won't release his tax returns for the last 5 or 6 years, and I absolutely do not trust him. Romney's prolonged stutter in Wednesday's press conference is reminiscent of another Republican candidate with a similar troubling tic: Herman Cain. I expect to see this odd stutter moment in Obama ads soon, it definitely leads one to doubt Romney's abilities to be cool under pressure and show the steady-hand of a commander-in-chief. No. His tax returns would be his biggest challenge. Killed his chances when he make the Romney apologytour. That's the tour he made to England insulting the English and to Israel insulting the Palestines. and then should have apologized for leaving the USA. How can the people of the world respect the U.S.A. when American citizens have now respect for their own President. The way Americans are divided in their own politics is the way they are now coming across to the rest of the world. Time to turn back and let the President speak as the person in power. Stop tearing down the Presidency. In a more perfect world the answer would be yes. However, we live in the real world where the republicans and their supporters do not care if you are qualified. As a matter of fact, the more unqualified the better. Mittens is almost perfect. tampa, fl has anyone looked at whom mit is running against? obama makes carter look good, so i'd say no, just about anyone the republicans could have nominated, including a dancing bear would have a good shot in this election. the dancing bear would probably have a real birth certificate too. No, it was the final straw. Romney showed again that he has no understanding of foreign affairs, or what is appropriate in a volatile situation. This on top of his ever changing policy stances, his etcha sketch run for president for the last five years and beyond. He was too the left of Kennedy, then later he was too the right of Akins. He is a secret man in a secret religion. He is a very wealthy man who wants to lower his own tax rate. And he won't show his secret tax returns. Or tell us about why he has money stashed in Bermuda, the Cayman Islands, and Switzerland. We really should not be surprised by Romney's disgraceful behavior. This is a man who will do anything, say anything that he thinks will help him win the election. He comes across as desperate, and desperate men will do desperate things. God help America if he is elected! Not at all. Stupid people say stupid things. He lost the election by being stupid. No, Mitt Romney killed his chances of becoming president when he pandered to a radical faction of his party and espoused radical, backward-looking social policies that he himself doesn't actually believe in. This callous political miscalculation on the anniversary of one of the greatest tragedies in our nation's history just iced it. No Jack, even though his latest antics have put "quite a load in those Magic Pants"; I'm sure that The GOP will supply an ample amount of TALCUM POWDER to this situation and Mittens will carry on. Hope springs eternal! One can only hope. I didn't think I would ever see someone more reckless and dangerous than G.W. Bush, but then Mitt came along and my worst fears were realized. It is very clear that Mr. Romney is not ready for the complexities of US foreign policy. Worse, it appears that Mr. Romney's ill-conceived and aggressive stance re events in Libya was in response to right wing goading by the likes of Laura Ingraham and Rush Limbaugh. Do we honestly want our nation's foreign policy dictated by talk radio hosts? This week, Mr. Romney effectively disqualified himself from the office of the presidency. Governor Romney has ruined his chances at the White House, not with any one statement, but by his constant showing of his misunderstanding of foreign relations. As a 19 year old Political Science major, even I understand that you can't insult every nation we have a disagreement with and expect to have a successful administration, Mitt needs to understand that just because we don't launch a nuclear weapon, doesn't mean we're apologizing. Mitt has a golden opportunity to win this election, but will lose it, based solely on his alarming body of work in foreign policy. Another knee jerk reaction from Romney and the GOP (with the exception of a few intelligent Republicans). Hurt his chances ... ya think??? This is not the OK Corral – you can't come out with guns blazing. Haven't the Republicans learned anything from the last 11 years? As a Canadian, I can only hope that Romney DOES NOT get elected President – it would be doomsday! No. Obama should be weary. Republicans can twist and turn missteps of any Republican and make them look good instead of a Democratic! Are you kidding us ? – he may just take the complete election after the cluster bomb that this administration has going on in the middle east. It is pathetic to stand by and watch this administration squirming on how to correct the storming of these embassies ...... I'm sure that they'll plan on how to blame these on Romney too. Just close your eyes and imagine Mitt Romney as Commander in Chief... now kiss your behind goodbye. that he was not fit to be the President. Could it come to pass? Mitt Romney HELPED his chances by reacting with STRENGTH rather than appeasement and weakness. If Mitt is criticized for speaking out, WHY ist the president exempt from criticism after he sought out an interview several hours later in which made a NASTY comment about Mitt Romney? Obama should NEVER apologize for our first amendment right to free speech. THAT is the OUTRAGE. Mr. Cafferty, he did not hurt his chance at all. It's should be obvious to all clear thinking voters that Romney is willing to provide real leadership that the current dullard that occupies the oval office lacks. Jack, the Obama administration dropped the ball, once again, and blamed someone else for telling the truth. Obama doesn't attend intelligence briefings, apologizes for America whenever he can. and has failed as President. Mitt Romney's comments guaranteed he will get my vote. The 'current regime' must be voted out of office for the sake of America remaining a world power. absolutely, not only did romney try to persuade people that he can add 12 million jobs to the U.S. economy but now he shows he's far too ignorant on foreign policy to be considered President of the United States let alone Commander-In-Chief. Let me remind you that this is the guy that disrespected the 2012 summer olympic games that were held in the U.K. our closest ally! Cottonwood, Arizona - Mitt Romney quickly brought it to the attention of the people of the world that the U.S.'s foreign policy is weak and inadequate. To not have proper protection at the US Embassies on 9/11 is a pathetic lack of leadership. There were plenty of warnings and the president allowed violence to esculate. Now, Obama will use this disaster to boost his numbers and contributions as noted by his quick exit to Las Vegas and his speaches away from his appointed responsibilities. Absolutely, Romney proved that his response to a crisis is to shoot from the hip first and figure out the facts later. When a president does that, people die unnecessarily. When a president does that, we get stuck in 8-year-long wars for no good reason. Obama knows the importance of learning all the facts first, then acting decisively based on logic rather than emotion, and America has now seen the constrast. An important event has put the focus on the Presidency, and it has the attention of a concerned public. Bush was a wartime President at the time he was running for re-election and won. The point is, the public is more comfortable with the White House resident when things are seriously unsettled. FDR lasted though four trying terms in office for example. The life span of this middle east problem may be a factor in November, and then again something else may hit the fan. Mitt Romney killed his chances of becoming president because of his arm chair quarter back criticism of President Obama handling of the violence in Egypt and Libya. His comments were a knee jerk reaction aimed at scoring political points. America needs a steady hand at the helm, not knee jerks reaction criticisms. Romney is not qualified to lead as president his comments reveal his leadership ability... None. I would certainly hope that this displays that Mr. Romney is not qualified to be Commander in Chief or in any way represent or speak for the United States. To run a campaign on no specifics, lies and blame is apparently fair politics these days. But to try and make political points while our embassies and our citizens are being attacked is more than poor judgment. It is endangering lives of our citizens and our military. He apparently does not understand that running for President of the United State means the world listens to what you say. When he questions the actions of our Commander in Chief, during a time that events are continuing to unfold, he sends a clear message that Americans are not united. To say the President is sending mixed messages and should not apologize gives support and emboldens those who want to fan the flame of US hatred. Mr. Romney has sent nothing but mixed messages and multiple positions on every issue. He should leave violent, volatile, international situations to the professionals. His uneducated opinions and partisan speaking points on this situation can only do harm. No why is the media knocking romney. Obama and his pal hillary are the ones who created caos in the middle east not romney. The ambassador to libya would still be alive if gadhafi were still in power, and that is a fact.The media will do and say anything to keep the messiah in office. The doctor who turned in osama bin laden is sitting in a pakistani prison. Why doesn't the media demand that obama rescue him, instead of bragging that obama killed osama bin laden. Obama didn't find osama bin laden he was turned in, and he didn't kill osama bin laden the seals killed him. No. His chances vanished quite some time ago when he started flipping all of his positions on virtually every issue in order to appear to be a conservative. Well, that's ASSUMING he HAD a chance to begin with but, YES, let's hope so; he has shown himself in all of his glory. A DIMWITTED, out of touch clown! As a CEO, Mitt Romney had the luxury of perusing the cream of the crop when it came to deciding which proposals to accept or decline. His subordinates did the grunt work of combing through all of the applications for capital and presented him with the best to choose from. As President of the U.S., he would be tasked with deciding items that his underlings could not or would not do. Based on his mis-timed and (no matter how you spin it) devisive comments in one of our nation's times of need, he has proved that the job is truely beyond him. His true colors are coming out and they aren't pretty. One can only hope that he doesn't get into our house and create more havoc like that other guy did for 8 years. In times of stress we make decisions based on self and he is not making good choices in his words. Romneys recent remarks concerning the Libyan situation are not going to lose him votes amomg the choir. It may give the fence sitters a reason to pause, before voting for a man that is demonstrably loose with the tongue. But I will still say, as I have all along, that Romney doesn't have a prayer of winning, as long as Obama has the support of the Republican Party Establishment. Even John McCain, was reduced to giggles this morning on CNN, when questioned by a morning host about Romney's remarks. He said, ( something like), he wasn't the one to advise Romeny on campaign strategy, based on the results of his last performance. It was a very charming momment, and the CNN hosts gushed along with McCain, at the merryment of the moment. Doug, Pepperell, MA. Why should Romney lose his chance as being President because he came out and voiced his opinion. He did what Obama should have done but Obama was too busy fundraising and campaigning. Obama should be the one to lose the election because he did not do his job. He always campaigning and when crisis like this happened he should have cancelled his campaing and gotten back to the Whitehouse and do his JOB if he knows what that means. Why are you not asking the same question, Jack, of Obama because he failed to do what was expected of him. Obama is a loser and does not deserve to be re-elcected!!!!!!!!!! Being an arm chair qauterback is so easy. Unfortunately Americans have short memories. Obama is pro abortion who is trying to force everyone to agree with him so he isin't right either. No. His chance vanished when he picked Rep. Ryan and tried to have his wife pretend that they weren't well off and had to struggle in life. I won't mention the recurring issue of his multiple flip-flops. I sure hope it does, because he is not qualified to be President. I’m sorry Jack, but it’s not all about the economy. It’s about being a statesman and a politician, and representing this country on the world stage. A world that is vastly different from what Romney and his advisors want to accept. How many wars does he want to fight? How many soldiers does he want injured or killed so we can push our weight around and not apologize? And he did such a wonderful job on his recent foreign policy trip. He is a businessman, pure and simple, and he is just not ready for prime time! He was already going to loose, but, YES! I mean come on, won't release his taxes, won't explain his Tax Plan until after the election, REALLY? He'd make a Bad Used Car Salesman! Romney has blundered through foreign affairs from the get go (took him less then a day to put off people in Britain during the Olympics). His America has no apologies stems from his white privilege and his inability to understand that humans make mistakes renders him null for the presidency and a very scary possibility if for some reason greed succeeds. Ya think! He should of kept his mouth shut until he knew all the facts. We can have only one President at a time like him or her or not. It will hurt him big time and if nothing else it will give Obama the edge. When he talks like he did he makes Bush look like that leaning left republican. He certainly didn't enhance it. Even Republicans didn't like his reaction. It only confirms that he doesn't know what he is talking about, his lack of diplomatic skills, and that he says whatever the current audience wants to hear. If he continues to act like that as president, he – or his successor in 4 years – would have a lot of apologizing to do. Just one more example of his inability to adapt to situation, appear presidential, and keep himself informed and surrounded by people who think and not just react. His comments in London, his comments about Isreal's health care, etc show a man who does not think-as Colin Powell said. Romney is just another republican paper tiger. So many "war time" republicans rattles a saber but if you look a little deeper you'll see their resume rarely has more than a reservist status mentioned. They have desk drawers full of deferments or just chose not to serve but once in Congress hear them roar. Meow. He was done in once he said that the auto industry should be allowed to fail. Like Al Gore, anyone who can't win his home state should not be President – which he can't do unless he starts calling Utah home. Hi Jack, Reagan taught Republicans the importance of public image in politics but Romney must have missed that class because where Obama has played “Mr. Cool” for over four years, Romney is playing Mr. Fool. On-the-other-hand, it is a win-win situation for Romney. If he killed his chances of being president that means he still has control of hundreds of millions in donations, does not have to be president and is home in November. Maybe he is cool. Romney's knee jerk reaction proves that he is not Presidential material. I don't think that he ever had a chance in the first place. The more he talks (lies) the more he reveals about himself. Romney did two things that should make anyone think twice about voting for him as president. 1) He acted without knowing all the facts (according to his version) and 2) he deliberately misunderstands the statements of others, if he thinks he can turn it to his political advantage. Would a business executive make (e.g) an acquisition decision without thoroughly researching it? Can any native speaker of the English language think that a statement rejecting religious bigotry is an apology for free speech? Or was Romney trying to say that it is a basic part of American values to defame Islam? Does he really believe that the first statement was made after the attack on the consulate. For that matter, does he even know the difference between an embassy and a consulate? Make that three disqualifications – he has less than zero foreign policy knowledge. Absolutely not. It is interesting to note the media ( and the WH) apparently are more interested in attacking Romney than they are willing to report on this very sad event. Do you not remember John Kerry commenting in 2004 when Bin laden surface within a week of the Presidential Election? Talk about a double standard in the media. Willard Romney has a principal and value deficit....and becoming president will not give that to him. There was nothing wrong with Romney's comments on the violence in Libya and Egypt. As a presidential canidate and possible future President, he has not only the right, but the duty to express his opinion over the continued use of apologies President Obama and his administration exercises for our foreign policies. The mainstream liberal media went into a full court press again to protect President Obama, trumpeting Romney's comments that are viewed wrong from only a liberal/progressive ideological view.. The President actually disavowed statements from his own State Department. President Obama owns the State Department – it is his. It is typcal Obama, his first reaction to anything that is negative to him, is to assign blame to something or someone else and the liberal media promotes it for him. He is never at fault. What a total presidential and administration failure. The Ambassador had no protection in violent and unstable mid-east country. The US spends over $100 Billion a year on intelligence gathering, and just like the beginning of the so-called Arab Spring, no-one had a clue something was going to happen. We have a worthless State Department, and a President who is more interest in his own political campaign for his own political self-interest than being President and a liberal press who are nothing but a bunch of bias political hacks. You would think that he had Jack, but sadly he's still in it and will remain so while the special interests that are driving his campaign are calling the shots. Let;s face it, thanks to the partisan divide the electorate is no longer interested in policy, but now prefer red meat in bumper sticker sound bites at every turn. Sadly we are no longer "united" States. I think Obama has some explaining to do also. Why would he even consider showing support for a group who has just murdered an American, shameful. Obama is also in a tight fix right now, he supported helping Libya and took actions without congressional approval. That sure didn't work out to well for Obama. Maybe Romney did respond too quickly but I think he was right and as a presidential nominee he should have the right to criticize the CIC when he thinks he is wrong. Obama has done his fair share of criticizing Romney. I sure hope so Jack. This silver spoon has no idea how to deal with reality. Mitt Romney can't win this election by merely appealing to his base. While they are eating this up, I'm not so sure its doing him any favors with the sliver of independents both sides are vying for. Romney never had a chance to begin with, so what's there to kill? This presidential race is not even close. The media has portayed it as a dead heat just to keep viewers tuned-in and advertisements pouring in to pay for the expensive talking heads..... sorry, politycal analysts they hired. Romney responded with all the force of a baby brother telling mommy big brother isn't good enough to be her favorite. That instead he (Romney) should be favored because big brother is yucky. can you believe Americans actually think Romney is ready for the big chair after flubs in England, Russia, about China and now at home? His comments weren't politically fatal, but he certainly didn't help himself with them, either. He continues to impressive uncommitted voters unfavorably. It didn't when he made his blunder with the Chinese dissident issue in May, but I am sure that it did now especially since we lost 4 Americans. Just look at how each responded Romney hurried to put out a statement that blasted our president void of facts and full of LIES and Obama who gathered all the FACTS, kept calm, cool, collective, spoke to the nation about what had happened, that our thoughts and prayers are with the families of those lost, what was being done, etc.. I didn't see anything wrong what Romney did. Obama is the one that should be criticized. The Liberal Press is the one that should be criticizsed. That's why our country is so divided, the press doesn't represent the people. If you eliminated the Liberal press you would not have the problems you have today. Example listen to the clowns on MSNBC. They never have a guest on the show for opposinjg views. All they do is ridicule the Republicans. MSNBC should get their license taken away. Sad day in America that supports a President that wants to destroy America socially and economically. I hate to think what's going to happen if Obama wins again. Did we forget what happenned in 2010 elections. People were disillusioned and kicked out all the phony Democrats in Congress. . It will happen again in 2014. Astounding that a core-less, values bereft man like Romney could become president. The best summary of Romney's actions is the political cartoon with him plastering a ROMNEY 2012 over the headstone of the ambassador that was killed. Jack: Governor Romney should have been more patient before blaming President Obama for everything, but by rushing to judgement Mr. Romney showed his stupidity, and lack of basic skills in foreign affairs. Gov. Romney made it worse the next day by making the same remarks. Mr. Romney needs to beg forgiveness for remarks from the Late Ambassador Steven's Family I do not thing Mr. Romney will ever be ready to be president in my life time, or my son's, or my grandchildren's life time. I sincerely hope so. "These are the times that try men's souls", not the time for A tax avoidance expert & his right wing boy scout. One can only hope Jack. No, it's about time somebody started standing up for this country again. If anything, it increased his chances. Of course it would help if the media were interested in reporting facts as opposed to furthering their own agenda. Please ask this question again after the debates. I really, really, really want to see the debates - all of them. No cancellations. Thank you. Gov Romneys remarks absolutey hurts his efforts to become the P.O.T.U.S. This election will be decided by independants whoms jury is still out on Romney. Voters perception of Mitt Romney rather on not they are comfortable with the concept off Romney being the head and leader of our nation will translate into vote come election day. Unmittigated Mitt. This isn't the Olympics in Utah. Silence is golden- just like the medal. There is a time and place for everything, and this wasn't time to make political "hay." Maybe he can run again in four years, for the Olympics, that is. reacts to quickly and as a result makes misstalkes. His reaction to Libya was just another nail in his political coffin. Romney would of won the moment. but he's no McCain. One has to approach Government with a certain sense of humor to appreciate it’s full flavor. That said: given Mitt’s Gumby like flexibility I was certainly amazed to find his position stronger than Obama’s. There was the look on Romney's face at the press conference where he doubled down. That look spoke for him, "Yes, I have killed my chances of becoming President." Yes, he did himself in. This country doesn't need a irrational, shaky, wild eyed shoot from the hip cowboy, shoot first ask questions later president. Romney is a disaster and any sane person who believes this man would be a good commander in chief needs their head examined! Hard to say. It remains to be seen what the extent is to which the tragic events in the Mideast and the possible followup will overshadow the economy as the main topic. Needless to say that Romney's remarks are not helping him in this race. He never had a chance, Jack. From his incredibly vague tax plan, his flip-flopping over his plans for Health Care Reform, and his inability to show any strength in foreign policy matters other than his scripted 'Pledge of Allegiance to Israel', Mitt Romney has been killing his chances of getting elected nearly everyday since he was nominated. This is just another drop in the ocean. His campaign has basically become "I'm the exact opposite of the President", even when the President has done the right thing. The irony is that in 2008, Republicans accused Obama of being vague, having few concrete ideas, and no foreign policy experience, so for 2012 they go out and find someone who's even more vague, with even fewer ideas, who seems to be even worse with foreign policy. Mitt Romney has done nothing to show he's a strong leader with principals. During the primaries he was constantly accused of being a flip-flopper who would do or say anything to get elected, and he's reinforced that at every point of the campaign. Yes. I always thought people were reluctant to vote for Romney because he's a Mormon. Then I realized that was a typo. No, he is going to have do do a lot worse than that to convince me that he is not better than his opponent. Up until now, I just thought of him as an empty suit. My feelings have shifted downwards. Those embassy people deserve better than this self-serving snake to be their leader. Our troops deserve better than this. Any decision he would make as President would NOT take people into consideration. Romney's just trying to take a strong stand on free speech. The embassy in Cairo started all this by saying," We firmly reject the actions of those who abuse the universal right of free speech to hurt the religious beliefs of others." (NY Times 9/13/12). Romney wants us to stand up for those who abuse the right of free speech. Isn't it an American value to want to hurt the religious beliefs of others like Catholics, Unitarians, Jews, Mormons, Portestants and athiests? I can't remember. I fell asleep when they talked about this in high school. Mitt Romney didn't have a chance to begin with! I think he's pretty much finished. He showed no remorse for the fallen Americans who died in the line of duty. He displayed no sympathy at the time of tragedy, by attacking the president. Yes. The Romney/ Ryan ticket along with their far right conservative and neocon agenda is in quicksand. I don’t know about anyone else, but he killed his chances with me long ago when he refused to provide his tax returns, when he couldn’t give straight answers to any reporter’s questions, when he bungled through his overseas trip and insulted our best friends and when he gave “flip-flop” answers to questions, depending on the day or place he was asked. He is unfit to run a company, let alone a country. Any fool can run up debt, fire people and abscond with funds leaving a company and its employees in the lurch. Even I can do that. It is much harder to rescue and fix an ailing company. Mittens has slowly been killing his chances but this might be the last nail in the coffin. He is so desperate, he tried to seize the political moment without really investigating the facts before shooting off his mouth. I think intelligent Americans can see that he will say and do anything to get votes. I wonder if he wins whether he will like the job or will it be another Mass ? II remember when he said the first thing he would do as President would be to repeal Obamacare. Now he is embracing some of it. Maybe he has Alzheimer's ! Everyday is a new day !!! I believe in elections past, that Mitt Romney's misstep might have been a serious gash in his Presidential campaign. However, in the clutter of Twitter and political blogs and the daily cable spin cycle, the election is still over 50 days away. Each day represents an opportunity for major media swings via the stock market and economic news, foreign relations, and the myriad shots to the foot that could come in the weeks ahead. However, I think Romney is more vulnerable to more gaffs. He's made a few of them and perhaps he's compounding his negative interest. As much as Obama seemed to stretch ahead in the past 10 days, I think the day-to-day is too unpredictable to call the election yet. Mitt is right. Jack I didn't hear you complain when then Senator Obama running for President criticized Senator McCain about his foreign policy in July 2008 the same day 9 US servicemen were killed. Don't be a hypocrite. This President is clueless and the State Media (you guys) supports him regardless of the truth. No Jack. Not yet. Unfortunately, some voters are way too tolerant of Romney's missteps, because they want to replace Obama so bad. 2 or 3 more blunders by Romney's campaign (and they will happen before the election) will be enough to convince voters that Romney is a good business man, but too incompetent as a leader for me to vote for. I think a lot less of him than I even did before. He's not just an empty suit, but someone that does not take into regard anyone else but his own wants. Romney said irresponsible words that could get Americans hurt or killed. The world is holding its breath on the outcome of this election. I did not think anyone could be worse on foreign affairs than W. I stand corrected. Seeing as how the office of the President of the United States is one of the most important positions that a man can hold, we must have a President who does not react on emotion and who will bind himself to the chains of our Constitution. Protect it with his entire being. We cannot let our nation fall into the hands of another who does not stand on principle, but rather takes orders from others in secrecy and reacts emotionally. Mitt Romney will not lead the U.S., but rather lead us down the same path of Unconstitutional never-ending war. He will work to bring the U.S. under more control of the criminal United Nations. He will take orders from those who bought him. Give empty speeches, and further destroy the morale of our country. He took this election by fraud. We need a true leader like Ron Paul. In my opinion yes and the more I read about his record as Governor, the more disturbed I become. The man is altogether UN-together. He is an opportunist much like Sarah Palin. Not a consistent, steadfast person. Seems to have no compassion "for the least of these" as the scriptures calls the poor, elderly, and the strangers in a strange country. He has no reverence for the office of the President of the United States. By running ahead of the President before the facts came in... That should be a warning to "We the People. I'm tired of war, death and dying for causes around the world for profit. I'm thrilled President Obama and the Navy seals got bin Laden with out one of my or your grandchildren or children having to die on foreign soil. I'm very unhappy that "America the Beautiful" has Representatives in government who earn more from bribes and don't cooperate with the highest office in the land while serving "We the People". And for the greed of the so called elite. I don't believe there is any mention of "Capitalist" being a part of the design of our Constitution. No, Romney will not get my vote, as long as...one vote per person rules...In the United States. Mitt is right. Jack I didn't hear you complain when then Senator Obama running for President criticized Senator McCain and President Bush about their foreign policy in July 2008 the same day 9 US servicemen were killed. Don't be a hypocrite. This President is clueless and the State Media (you guys) supports him regardless of the truth. To somewhat quote Pres. Reagan, "There you go again, Jack!" By his comments, Romney showed that he IS a leader, unlike the 'campaigner-in-chief' Obama. Did you know that in 2008, then candidate Obama politicized the killing of 9 US soldiers in Afghanistan criticizing George Bush and John McCain? Did you know that Carter in 1980 basically said the same thing, "He shoots before he aims" about Reagan. Did you also know that while 'all hell is breaking loose' in the Mideast, Obama went to Las Vegas for a campaign fundraiser?! Unbelievable! Mr. Romney had no chance and he knew it. His actions and statements have sprung from desperation. Blundering and blustering, hiding his taxes and his money abroad, keeping his plans secret, and selecting an incompetent religious fanatic supporter as his vp nominee, he didn't have a chance anyway. This was just icing on the cake. People are creatures of emotion not creatures of logic Romney was acting emotionally not logically he should stop worrying about fighting his way back into the presidential race and just let his moral charactor lead to greater judgment no one was really expecting an unnecessary, untrue, remark from the GOP nominee, he reminded me of a spoiled man who was once a spoiled child who has just attempted to win a presidential election with sinsacialism – Its not gotta work. The real question is: should news outlets pose simplistic and leading questions that accomplish absolutely nothing? Mitt Romney's comments and temperment are starting to remind me more and more of Sarah Palin from the last election. The remarks in my opinion were made to fire up the tea party base and it frightens me to think we have our own extremists to deal with. He does not have the poise and intellect that the President has when he is in front of the media. This is one of many blunders. Hopefully, it's the icing on the cake. No way should this man be president!!!!!! I'm no fan of Obama, but Romney making rash, inflammatory, and ignorant allegations shows that he is not Commander in Chief material. Romney fires his verbal rockets from the hip without telling us what what he would do differently. His Presidential aspirations are quickly turning from slim to none. No. The only way he will lose if you guys keep lying. Do the job you are being paid to do, reading the news. We do not want to know your theories or opinions etc. We all know you are all in the tank for Obama, none of you are honourable. God help this country. The real question is did the mainstream media do enough to bring Romney down for saying what we all were thinking. The collusion between reporters at the Romney news conference to coordinate attack questions clearly shows they were not interested in the crisis nor the Presidents handling of it, they wanted to pin a gaff on Romney for saying something the White House already agreed with later on in the day. The Mideast is going up in smoke, the President's policies are failing, the radicals are undermining everything we have accomplished there and all the media can do is go in to a frenzy over the timing of Mitt Romney's statement rather than question why this is happening and why is the President's crew trying to blame a video when the proof is in that the attack that killed the Ambassador was a planned attack on 9/11 by radical Muslims and not a protest. From where I sit, the American people should kill Mitt Romney's chances at ever becoming President before he elects to get us all killed not even knowing why. Romney STILL has my vote. Even if this were the only glaring mistake "Governor" Romney had made during the long election season, it would suffice to disqualify him for the presidency of the United States. His failure to admit his many initial errors in judgment - violating the 9/11 embargo by releasing an ill-advised criticism of President Obama based on incomplete or erroneous information - were compounded by his nonsensical, smirking defense the next morning. Simply put, he chose divisiveness over unity, grandstanding over solemnity, and selfishness over grace. It's been said so eloquently by so many others that I can only shake my head and wonder how this narcissistic cipher ever gained the nomination. No Jack, but it does not help his position of being presidential. Other Presidential candidates have defered to having the President take action and then make comment. Mr. Romney as a businessman and Governor was held to a different standard of correcting a path that was veering off course. President Obama is not exempt from making the same mistake in the past, he has simply gotten many 'get out of jail' passes from a press corps that seems to not want to hold him to as high a standard as they do Mr. Romney. He needs to learn this lesson or he stands a good chance of losing. He has to respond, but he needs to wait his turn. While the Embassy in Cairo speaks for Obama/ Sec. Clinton he must be careful. This lesson should help him in the debates with Obama. Mitt Romney suffers from a condition known to exist on older GOP males called "premature declaration". This condition is embarrassing and is known to create problems when the facts that are eventually presented differ from your perception. However, when he doubled down on his original statements, he proved that he doesn't know the difference between being a leader or a bully and ignoring facts in order to make points with voters is what leads countries to war. I was very much on the fence between Mr. Obama and Mr. Romney but after this DISASTER I am going for Mr. Obama. I do not want Mr. Romney anywhere close to the atomic football. This man just showed me he is not qualified to be our President. There is no way a sane person could vote for him now. All he has left are the wing nuts and haters. Maybe he could invite them to his lake house for a party on election day. At least they would get something out of it. He's done as a candidate. Romney sure showed his lack of intellengence. To be someone so into himself he sure messed up. Let's hope Romney doesn't win the election. I hope we never see him again. Build your car elevator and hide out in it or better yet go live in another Country with your money. A wannabe Prez. he ain't. Every time he opens his mouth he ensures my vote will go elsewhere. If Mitt waited for the WH to get their facts straight he would have been accused of not responding in a timely manner. The real question is...does the President have any idea of what the left hand is doing while his right hand is digging in the pockets of his LV cronies...or better yet does he care...after all he has an election to worry about. Now Mr. Oopsbama cannot remember if Egypt is an ally or not an enemy. Mitt my boy, is not use to not having his way. This great grand mother says,he has finished displaying how incompetent he is internationally and nationally. His money and his supposed to be looks will not win the election for him . his rich wife hopefully, who has never worked a day in her life, except to push some babies out of her body, will not see the inside of the White House. If they do, God help all of us. He's a dishonest individual. That's why these things keeps happening, because he's only trying to blow which ever way the wind blows to please the "severely conservative" members of the GOP. He probably did, but it doesn't matter much. Americans are too stupid to recognize what a mess President Obama is making of their country and its international reputation. They'll vote for any slick demagogue who tells them how great they are and how much he "believes" in them. It's akin to the American educational disease only on another level. His reaction should give us reason to pause. He and his campaign were so intent on his comments being first, they didn't wait for all the facts. Is this an indication of how he would govern? Or is it simply a window into the panic that the campaign felt because of the right wing media complaints concerning his campaign? During the Romney press conference, Peggy Noonan said he looked like Nixon, with a grimace on his face. Gov. Romney has a problem and he sees it each time he looks in the mirror. With every attack Romney seems to diminish in stature and grow in pettiness. They both sound like school yard children...Nanny, nanny, boo, boo. They are both unfettered by the truth, but Romney's messaging advisors are awful. Mitt Romney is a good and decent man but I fear for this country if he is elected president. Pres. Obama responded with an intelligent and measured statement after he had been given all the facts. Romney shot from the hip, just as George Bush used to do. Add this to his earlier statements that he would approve of bombing Iran and this would take us into another Middle-Eastern War. Problems in the Middle East must have negotiated settlments not more bombing and killings. Mr. Romney may have been succeeded in the boardroom but, I fear, he would be a disaster in the Oval Office. Vote intelligently – Obama and Biden in 2012. I don't know that anyone will remember this come November. Americans have a pretty short attention span so unless the spotlight is kept on it, I doubt it will matter in the election. However the overall impression of Romney is that he's not real. Reminds me of Ken of Barbie doll fame. And so far I've not seen him voice an original idea. That doesn't mean I'm please with President Obama either. In my opinion, we need more choices than Republican and Democrat. The only way that will happen is if we quit voting for the lesser of two evils and support a third political party. The "We're taking back America" bunch are going to vote for Romney, no matter what he says or does, their choice has nothing to do with politics. The rest, those who vote based on substance, especially in swing states have been looking for a reason to move in one direction or another. Romney's, quick to fire , comments reflect his tendency to act before thinking and America has had enough of that from the last Republican administration.
. Obama is presenting himself as an experienced, calm and confident leader, Romney is looking desperate. I would say Romney is close to defeating himself and the way he is going will probably offer up this campaigns "October Surprise" to seal the deal. Yes, he absolutely ended his presidential run with this ridiculously un-presidential reaction. The fact that he "doubled down" on his remarks after he was proven wrong, shows that he possesses the worst qualities that anyone would ever want in a commander in chief. Hey Mitt, sometimes apologizing is a good thing. You should try it some time. Didn't hurt Romney at all. I think his international business experience and heading the Olympics is than Obama started out with. Obama was a Chicago-style Junior Senator who knew how to deliver dreams in a speech. If Romney said nothing – the press would say he had nothing. If he speaks his mind – the press still says he's wrong. I wanted Obama to be a good President – it didn't happen and I'm not blindly loyal to any party. I think what is needed is a President who understands how business works in the real world. I dont know what Mitt Romney's stand is for anything.Does he know? Not in my book. Truth is the precursor to good judgement, not political correctness. Truth and victory is what we want, not fallacies and failures. I think we are all being played by Romney deliberately dropping the ball to throw the door wide open for Obama. How else can one explain his bungling? Looks like the mitt can twit it up without he3lp. Halleluya! Yup, it just shows how unfit he is to be The President. Shoot first, ask questions when the smoke clears. Americans are so divided it is hard to say. While many Democarts are enraged by his remarks many Republicans are thrilled. When people can overlook what Tod Akin said I'm sure what Romney said doesn't matter in the least. No way... A dead suicide victim can't kill himself again. In the United States we make Broadway Productions like Jesus Christ Superstar that paints a religious figure as a different leader than what churches describe, but we do not bomb and destroy. Mitt Romney did not ruin his chances for the Presidency and a video did not create the current crisis in the Middle East. What caused the evil in the Middle East is hatred. Romney not only dug himiself into a hole, he threw out the shovel. By repeating his ridiculous comments hours later when the deaths were known, he showed this was not an inadvertent gaffe. We don't need to know anything more to disqualify him from the highest office in the free world. any statement , never mind one that is a movie film version of a bravado gunslinger. Between the silver spoon and his feet in his mouth he had very little chance.What kind of a moron would debase his president in the time of a crisis like this? He has no concept of being a leader or a statesman. I watched Mittens' interview with David Gregory last weekend and was impressed. However, this latest blunder undid everything for me. I wouldn't even think of voting for Mittens at this point. Also, Paul Ryan is scarey. If anything ever happened to President Mittens, I shudder to think what would happen to the country. I am definitely going to vote for Obama. It is not his repeated foot in mouth disasters that will cause Romney the election. It is his follow up explanation, and total flipping. You can not pull your foot out of your mouth and claim it is Delicatessen Ham Sandwich. Besides the number of times he has shot himself in the foot, he will soon expire from blood loss. He sure did. Sometimes he gets crainial(sp) rectal inversion. I hope so, Jack. I sincerely hope so. I don't believe it's this one mistake, but a plethora of mistakes that will cost Romney the election. He just is not fit to run this nation. "Turn out the lights...the parties over". Let's put it this way, he didn't help himself! Hopefully Yes. This was the last gaffe of continuous gaffes by Romney that clearly show what an idiot he really is. If it were not for all of his rich friends funding his propaganda campaign, he would be nowhere in the race. During any election, I generally keep my options open regarding candidates. What Mitt has shown consistently is that he is willing to do and say anything to get elected. I personally believe it is his (true) experience in the corporate world, which can be savage. You do whatever it takes to get things done, no matter who or what you destroy along the way. These are NOT traits that I look for in a President, therefore, he will not get my vote. No, I do not think Romney's comments put him at the risk of losing the election. Both the president and the presidential candidate's comments can be viewed in a negative light by different people. Now please stop being so bias on your news broadcast, thank you! IIf he had any chances left he certainly lost them all with this moronic demonstration. This comes from one who voted for Reagan, both Bushes and McCain. Mitt Romney has just given us more clarification that he is not a qualified Foreign Policy expert. It also seems that he is just another politician that cares more about the race...than the people he will govern. I mean come on... making divisive statements like that while the situation is still fluid? And some American's want his finger on the button? May all the gods help us all! I certainly hope so. The thought of Romney as President and Ryan as VP is truly frightening. Romney's statement came before he had the full facts, it was based on a statement not made by Obama and that had appeared on a consulate website before any violence had taken place. His statements seems to support and justify the message in the video that caused the uproar in the muslim world, and at no time did he mention that this video was discusting and apporant, as discusting and apporant as the views of the people that stormed US consulates. No he didn't. He standing up for what America stands for. How many innocent Americans are going to die before Obama acts. The world knows Obama is going to continuously talk and talk without acting. America needs to be firm and act, so groups know that there not going to get away with this. We need someone that will walk the walk not just talk the talk. At a time where the country should be united, Mitt Romney tries to divide it for his own gain. It is un-american, irresponsible and selfish. I dont want a President like that. Why yes, if Romney could screw this up with his knee-jerk "Shoot first and aim later doctrine, imagine...JUST IMAGINE, what he could screw up on with Russia or China on a massive scale. Think about it. Well Jack, He should have, but I don't think the media is going to stick it to him like it should. Politicians get away with way to much these days and the media has become powerless to pin them to their actions. Absolutely not ... I'm shocked myself at how many of the people I work with who feel (as I do) that Romney said what needed to be said. Most I've talk to (in liberal WA state) believe that without the interference of the media this comment by Romney would have been applauded. Before that was possible the media jumped in and told us what we're SUPPOSED to this of his statement. Yes, Mitt Romney has ruined his chances of being President. He is not fit to run this country. Especially in international relations and maintaining domestic and international diplomacy. He can't see outside his own limited "box." I believe so! If America elect someone like Mitt Romney it will look the stupidest country on earth. Yesterday with his comment I was embarrassed to be an american. This puts the cherry on the top of my feelings about Romney.... an old Texas saying, " All hat and no Cattle"
Not only did he make a stupid comment, he did it with a smug expression on his face. Almost as f he believed this was his "gotcha" moment. This guy is so unpresidential and so out of touch with real Americans. After putting both feet along with his expensive shoes in his mouth during a national crisis, before all the facts were known and then doing it again on tv and in front of reporters the next morning to upstage our administrations response, all heard over my laughter was CHA CHING! more votes for Obama.....hope he keeps up the good work! The only problem I have with Romney is that his language is too weak. He needs to tell it like it is: Obama wants to destroy Israel and that is the reason he wanted the Muslim Brotherhood in charge, doesn't stop Iran and allows Hezbollah to continue in Syria. The bigger problem is that Israel is too stupid to see what is happening. Yes, He showed he is not ready for the 3.00AM call yet. A true opportunist! I have been following Mitt Romney since the early 90's and as time has gone on,he quite frankly still has no clue about the way to handle himself as a contender into the political fray. His comments were damaging not only to himself,but to the country as a whole. His ego seems to be bigger than his aspirations,and this is not someone we need in the White House-now or in the future. Somebody had to say it! The truth is the truth! Yes Mitt Romney not only killed his chances of being the commander and chief but he was seen walking away after his comments with a smile on his face. Maybe not killed but definitely on life support. He might have a lot of money but I'm guessing someone else helped him earn it. He sure doesn't display much professionalism. And, yes, I'm a registered Republican (but maybe not for long). Mitt Romney is a political opportunist. No. He only put to words what alot of Americans were asking. Why didn't President Obama come out sooner rather than hide behind Secretary Hillary Clinton? Answer: He was afraid of the political fallout of being on the wrong side of Ahab uprisings. Of course he did. He looks desparate. Grasping at topics "ripped from the headlines" to find a new item to exploit. Well unfortunately for Mitt this isn't an episode of Law & Order and the reviews aren't as good. It's disgusting and makes him look shallow and crude. Mit Romney is too presumptive in his credulity for the far right wing. He will do and say anything to be elected, including insulting the Islamics that live peacefully among us. He has generalized negatively every Muslim. Furthermore, his remarks were not Presidntial, but had a kind of CEO -ish undertone. Such mistakes from a candidate cause concern. The same mistakes from a President cause casualties. He simply isn't ready to be the President. I do not think Barack Obama is good for America. It dismays me to acknowledge that Mitt Romney may be worse. Yes, this may be his "yee haw" moment. Absolutely not. The media is the only one making a huge deal of this. I actually think Romney was mostly correct in what he said. If we start off a "skirmish" by apologizing, like the original letter from the White House said, then we only look even weaker. We were attacked. Has 9/11 taught us nothing? Don't apologize for something that we didn't even do! Romney was right to stand up to such a flaccid response from the White House. Absolutely– Romney blew his chances by speaking out inappropriately. He needs to think first before he shoots his mouth off. Better yet, he needs to just go away. EActually jack it is times like these that the total failure of president Obama's foreign policy us exposed. As a veteran of enduring freedom, I can personally assure you, the people in the middle east know the USA will not do anything except talk talk talk and wait. Romney not only did not do himself in, but he will come out of this crisis looking like he is the one candidate who understands how to project American foreign policy objectives in a consistent way. Obama isn't sure now whether the Muslim brotherhood leaders in Egypt are friends or foes, while almost all Americans immediately recognize where we stand. David McManus, Toronto, Ontario, Canada. I hope it did. The guy is not very likable. No. This is just another liberal media over reaction. Annoy the media – vote for Romney!!!! Jack, Does anyone really remember what Romney said or stood for from one week to another? I change my underwear less than he changes his views , so why do you think it will be the "same view" tommorrow. If it polls bad ,then trust me his view will change! No, I don't think Romney hurt his chances with this comment, because the country is so divided today that whatever negative comment Romney makes about Obama will be accepted by Romney's base. This is how today's race differs from the one you mentioned involving Reagan and GHW Bush. Romney's comment will hurt him only among Independent voters, if there are any. Romney does not understand there are no do-overs when you are president. No practice sessions for hard decisions like he gets for the debates, which he will lose anyway. Mitt Romney has definatly lost my vote he is a man of secrets he is not fit to lead this country he scares me. He will do and say anything to gain power and runs when asked what he would do in specific crises. Stop downing your opponent and tell us what you will do already. Thank goodness Romney is showing his true colors now before it's too late! If that diplomatic moron is elected, our streets will look like Cairo's does right now. Jam packed with protesters. Not that Romney had that much of a chance before given his history of flip-flopping and his stance on women. Now we see that he shoots off his mouth before getting all the facts and then can't admit his mistake. We don't need another foot-in-mouth president. Absolutely not. The statement issued by the State Department was very alarming – the U.S. government accusing one of it's own citizens of "abusing" his right to free speech. Jack, hate speech is free speech, and while you and I agree that the content of the video is bigoted, as an American, you have the right to be racist. Governor Romney was right to condemn the government's attack on the 1st ammendment. I couldn't disagree more and believe Romney's quick response and clarity was refreshing and cheered by so many that are sick and tired of Obama' ongoing pandering to the Muslim world ..it's called strength and LEADERSHIP ! Yes Jack he just out one more nail in his coffen, my opinion the GOP could have dne so much better than Romney. They really went down to the bottom of the barrel with this one, last election they pick Sarah Palin. We know how that turned out. I am democrat so what if I care good for us. NO! I'm sick of hearing our president, whom I voted for last time, apologize for our country. Romney did not know any one had been killed when he made the statement. And it seems that the President's first concern should have been with the attack on our embassy, not the "feelings" of some extremists over a 17 minute video clip. From Hayward, Ca. No Romney didn't ruin his chances with THIS comment, collectively he has ruined his chances with ALL his wrong and insensative comments. Time and time again he has proven he is not ready to be the commander in chief, he speaks first.. And doesn't think about the ramifications if his opinions. Amazing he was leader of anything. I certainly hope so, his smirk as he left the stage yesterday says all I need to know that he doesn't understand the meaning of diplomacy. With his comment, Mitt proved he is not presidential timber, but a presidential twig. God help us if Romney & Ryan win the election. ONLY STRONG AMERICA can brake Terorisam, America is weak and they know this. They need to be scared from us not we to be scared from them. No doubt about it. He is unqualified to be president. Instead of uniting people he tried to divide and made false statements against president Mr.Obama. In no way, shape or form did he do himself in. However, I can see the liberal media having a field day with this and making it look like he did. I believe Romney spoke out like most other Americans have. Obama sets on his hands and is only concerned about his narcissist self. Romney did kill his chance because the only thing Romney thinks about is Romney Romney Romney Romney!!!!! IIf there was any chance he could have been elected President it is gone now. These comments from a candidate cause concern. Such comments from a President cause casualties. I believe that Romney's uncontrollable ambition to be elected President trumps (pun not intended) his common sense and his understanding of how to deal with a serious international crisis. He should have followed Reagan's example. Only if Americans are willing to sit idly by while our government officials continue to apologize to and coddle Muslim extremists that will never be appeased. Romney said what the president should have, with speed, force, and true conviction. But in a society where what is "popular" is favored over what is "right", I'm not at all surprised at the overall response. Romney once again proved that he simply does not have what it takes to be Commander-in-Chief. He might have been more credible with his remarks if he told us that 1 or 2 of his sons were going to join the military but we know that's not ever going to happen. He just want's to send the kids of the poor & middle class to do his dirty work. Wasn't this the guy who told us that we should have stayed in Iraq, that we should stay in Afghanistan, aid the muslim militants in Syria and attack Iran if Israel asks us? He's is not fit to be the president of anything except in business. jack, i think its time for romney and ryan to pick up their toys off the play ground and go home to,,,,,oh oh oh ! Like a well placed torpedo to the Romney campaign midship, Romney's studipity has blown his campaign right out of the water with his remarks regarding the US embassy in Libya. What a dumb-bell! Yes, Mr Romney has hurt his chances in November by giving the people of the USA a chance to see how a Tea Party sympathizer would act in a crisis. Knee jerk reaction creates chaos in foreign policy. There is no doubt in my mind that. Romney is incapable of being the leader of the free world. He has attempted to fshow his international/foreign capabilities and he has failed miserably. He blew it in the UK, he upset the Israekis and now with his "jump the gun" and politics tigon of the Egypt/Lybia situation, he has clearly shown he is NOT the man we need to lead this great country. Not only did Mitt kill his chances of becoming the next US President, he misrepresented American values to the world. The statement by the US Embassy in Libya accurately describes our tolerance for all religions, regardless of what may be contained in 'Innocence of Muslims.' 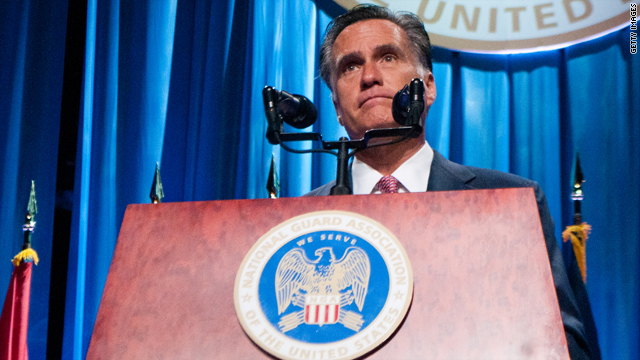 Of all presidential candidates in recent memory, Romney should be sensitive to this position. Yes, Jack. Romney's reaction borders on treason. It shows that he will do or say ANYTHING to get elected. I shudder to think of him as my Commander in Chief. No He did not! LIbya ATTACKED the USA when they attacked our embassy. that is a sign of war! Obama is a wuss.. he is afraid to do anything against the muslims! THEY ARE the enemy! THeir Koran tells them its okay to lie to further their agenda, so all the we are like the radicals is a pure lie! Wake up! Get your head out of the sand! OBama is a muslim with Communist training and he is out to destroy everything about our nation! Elect him, and you wont LIVE to regret it!. HE will see to it! ROMNEY was correct in attacking Obamas doing nothing! He is anti-Isreal too and was a POOR excuse of a president in his action toward Netenyahu as well! HE spit in God's face..not the PM'S! and our nation will pay the price! I think the larger question is what was Obama doing out campaigning while the Middle East erupted? Mitt Romney never had a chance because he is a stiff man and a stultifying bore. The only thing he has over John McCain is that he is better-looking. It is pathetic that these non-charismatic men are the best candidates the Republican party can muster up. If the saying "shooting yourself in the foot" has any bearing on this then YES he did Jack. Also people who shoot themselves in the foot should seriously think about not doing that while your foot is in your mouth. Ya think? Benjamin Franklin was quoted as saying " Better to slip with your foot than your tongue". Romney has done both...at the same time. No way! Romney was telling it like it is. Obama doesn't even attend half of his intelligence meetings. Why are you not mentioning that on CNN?? Romney will be the next president regardless of the liberal media. Ridiculous. Everyone at CNN is drinking from the same poisoned well. Sure, Mitt did himself in. So did Hillary for agreeing with him. The real question is how Obama can survive the catastrophe Libya and Egypt have become under his watch. Well, this might have been the final self-inflicted wound, but Romney has been rapidly killing off his chances for months with comments which prove he has no clue what is happening here, in this country, much less what is happening around the world. Yes – I was somewhat undecided. I feel no more conflict. How can Mitt Romney stand united, when he holds so many different opinions on the same topic? As a president, he'd made a fool of the USA. Absolutely not presidential during these troubled times. I found it to be very unbecoming of any candidate, regardless of party, to be playing politics in a moment like this. I am sorry to say that Romney has consistently missed opportunities to either say something, stand for something or just plain not say anything! Absolutely NOT. He was exactly right but the liberal controlled propaganda machines like yourself twist and turn and attack anything a republican does. "Criticizing America's Commander-in-Chief while U.S. interests were still under attack, and Americans were dying, comes off as amateur and un-presidential.." Did any democrat ever attack Bush in anything he did while this country was at war? It is typical hypocracy. I am an independant that tends to swing left but I WILL be voting for Romney...HEY HEY HO HO Obamas got to go!!!!! Yes! And thank God for that! How many times will people make excuses for Mitt's glaring errors! This is supposed to be an intelligent successful businessman, but he hasn't shown that let, alone the ability to run the nation. There is so much more to the Presidency than being a good businessman! It takes an intelligent thoughtful person. It's not Mitt. For whatever failures he may have had, President Obama stands far ahead of Mitt Romney when it comes to his ability to govern. Liar Romney and Lying Ryan both have a habit of opening their mouth and out rolls nothing but lies, what is it about this type of person that thinks they can say anything and expect people to believe them, Romney not only didn't wait until the facts were out before he opened his mouth and made stupid remarks. He should be refered to as Quick Draw Mittie and no we don't need anyone that makes a judgement call before they know what really happened. If he had been President the United States would probably attacking some country, reminds me of Bush and Chaney. For hours while chaos unfolded at the embassies, with the United States flag ripped from the embassy in Cairo and the ambassadors' lives in jeopardy, the only official statement from the United States was the US embassy in Cairo's condemnation of those who "hurt feelings" of muslims. Romney was right to call this out, Jack, why isn't there a more unified message here, and I wonder why there isn't more focus on our response to the protests in the early stages which could have prevented such a travesty, instead we're bickering about the timing and tone of Mitt Romney's statements. Tragically, roughly half the voters of this country will eagerly reward Romney for twisting the truth to disparage Obama. I think he had already ruined his chances, but these latest attack seals it. He will say and do anything to get elected. Maybe some of those overseas jobs of his should be directed to the Middle East, and maybe those people would not have time to riot and attack American interests in the areas. I just don't understand how people just cannot see through him and his dirty politics. What a jerk. Absolutely, Romney's chances were slim before this. The Romney campaign is in the rope a dope stage. No, would the White House position still apologize and appease the killers if he didn't say anything? Would the press call The white house on their position when it was clearly wrong. Clearly wrong because it was retraced by Obama after Romney brought it to light. Obama's middle east policy is an atrocity to us and the people of the middle east. Looking at the complex challenges this nation stands to face in the near future, our leader must act in precise, thought out ways. Even assuming Romney has not already done himself in, his recent statements have shown he is in no way qualified to handle situations that require care and non knee jerk responses. When most of the Gop united to show patriotism and resolve, mitt went beserk and attacked our President and country like aq. Which side is mitt on? What happened to the real Americans thinking country first? mitt can't even stand up to his base and tell then to act like Americans. He is too weak to be President. No. Not at all. Mitt Romney stepped into a void left by Obama's lack of leadership in a time of crises. This event does not parallel to any other in history, and it required a quick and clearly defined statement from our President. American's deserved to know that those who we have chosen to lead us will step forward in times of crises, not hide behind the "tweets" of a terrified embassy employee who was not speaking for the country. Romny waited to issue his statement. Still Obama said nothing. Nothing at all. I think the question you should be asking is, "Did Obama, and has Obama killed his chances of reelection through his actions (or lack thereof)? I doubt his campaign is dead but if it's close, it's been a slow, agonizing death. Romney's latest outrage is just one of a steady stream of missteps that paint a portrait of a character most unfit for the presidency. Still, I can't wait to see his "October surprise." I sure hope so. Mitt Romney is a loose cannon and is not ready to be commander in chief. Romney understands that Obama merely says what he wants people to hear and has shown the US as weak and sorry for what we represent. "Kill his chances?" Which time...??? "Lehman" moment regarding Libya and Egypt? Wanting to start WW III , IV, and V in Syria, Iran, and North Korea? Surrounding himself with bullying imbecilic Neocon advisors on foreign policy? Insulting Russian, Poland and Great Britain? Abdicating on Romney Care and women's rights? Or just himself, being himself, if it really is himself? Or having 5 unmemoriable points each time he speaks out of one side of his mouth lately? Will the really real (this week) Mitt Romney (if he can be found) please stand up? Having a birds eye view of Mitt Romney since the early 90's,it is apparent he still is clueless when it comes to how things are done in the political world. This arrogance is a sure sign of egotism over what is best for the nation. His comments were ill informed and a danger not only to those abroad,but to us at home. To elect this man as the leader of our country,would in my opinion,be akin to starting the timers on our nuclear arsenal-sheer Armageddon! Romney's response was irresponsible and totally unbecoming of a president. Rushing to judgement like this will put United States and all Americans to ridicule worldwide if Romney gets to rule as our president. Mitt to me has killed his chance of being America's commander in chief. Candidate(s) Obama, Clinton & Kerry were very vocal during their campaigns – and called upon their responsibility as Americans to question the soundness of the Presidents foreign policy decisions. President Obama has been working harder at getting re-elected than he has at being President – so I don't have any problem with Romney working hard at getting elected. To paraphrase Tom Hanks character in A league of their own – there is lots of whining in politics. Yes, this is what insincerity looks like. He is running for the highest office in the land, not a right wing talk show host job. By this incident, Romney has shown us his skills in foreign affairs and national security...he has none. I don't see how anyone could still believe this man is capable of leading us is a world fraught with danger and violence that requires careful and thoughtful diplomacy and tact. Absolutely!! As a registered Republician, that move by Romney changed my vote to Obama!! I have never seen two idiots like Romney and Ryan use a tragic situation for our country and make it political. Those rich idiots just are not worthy of my vote, I am for AMERICA!!!!! No Jack that would be impossible. Let's face the facts... Romney is a poor substitute for a businessman. Let alone choosing a tea party running mate who interprets the bible as if it pertained to the 21st century( minus the facts that do like I am my brothers keeper and do unto others...obviously. Then there's the endless lies from both or rabid disillusion, moral superiority complexes, I'll take mine first and yeah the dog on the car roof incident. He can't loose what was never a possibility. Has he forgotten the rest of us ergo mass majority isn't the one percent. This is the latest comment from Mitt Romney that indicates he will say or do anything to discredit the president. This hurts our country here and around the world. Come on everyone, we are United States citizens first, whether we are in a presidential election or not. This is why it was such an eruption over a obscure video! I think Romney is so anxious to look good that he really does'nt think first. President Obama put it correct by saying he shoots first and then aims. Hi Jack, I believe he did, as a former Marine, I would have been proud to have served under President Obama, but the kneejerk comments and reactions of Mr. Romney could cause even more needless risk and suffering to those Americans who are currently on the ground as well as all those who are en route to protect our embassies. I believe that Mitt Romney's impatient comments are just one of many reasons which emphasize to the American people that he is not worthy of the office which he now seeks. He was so quick to try and capitalize on what he believes was a moment of opportunity and weakness and that which he perceived to be a mistake made by his political opponent, President Obama, that Mr. Romney has failed to realize that he is not our President, and that he has not been elected to represent our country, and whether or not he will be elected remains to be seen. The recent events in the Middle East are not a subject that anyone should be using for political gain. President Obama, however still has a job to do, while Mr. Romney has once again shown all of us that he is willing to do or use anything to get elected. Maybe the former Governor doesn’t understand that in order to be a good leader one must first be a good follower, so instead of trying to jump out in front of the crisis, and try to take political advantage of a dire situation, could it have been possible that this was a time to stand with and behind our President, united together in support of our nation and her best interest. Mr. Romney should understand that there is much more than votes at stake in this situation, American lives as well as the lives of others are at stake, which I believe he does not or possibly, and even worse, he does not care. He got caught speaking out of turn, without having all the facts and intelligence, and that as a candidate as well as for national security purposes, he is not and should not be privy to. Mr. Romney, Just because you have the opportunity to say something does not mean that you should, ensuring our peoples safety and defending the lives of American citizens as well as the lives of all other innocent people no matter who they are, should always be at the forefront of everything we do as a nation, defending our values and rights to freedom of speech as well as any other civil liberties should always be secondary to the defense of the innocent. This was a mistake that a president cannot afford to make, and to President Obama's credit, a mistake that has not been made. Mr. Romney would do well to remember that he is merely a presidential candidate, not the President of this great nation. Mr. Romney should sit back down in the candidates chair, President Obama is in the driver’s seat, and I should mention that he is the only one in this situation who has been elected to do so. Certainly not! Mitt Romney took notice, stopped what he was doing, and focused on the issue. This is more than can be said of Obama, who had farrrrrrrr more important business to tend to on the campaign trail. And you question (?) which of these individuals acted in a more Presidential manner? I want a 24-7 President; not one who comes to the office when he feels the need, or has nothing better brewing. This man is not up to the task, nor has he ever been. I hope folks remember all of this at the polls in November. Mitt Romney decisive indecision has proven him to be an empty suit with a speaker inside and the microphone is manned by a bunch of Tourette Syndrome sufferers behind the curtain no one should look behind. Seriously Jack? What planet do you live on? President Obama had not received an intelligence briefing in the 7 days preceding this event and his Ambassador in Egypt directed the US Marines to not carry live ammunition and this is somehow Romney's fault? Romney was criticizing the response of a State Department employee who was being critical of our constitutional right of free speech to a Muslim audience...a statement that was not retracted or clarified by this administration for 15 hours. Obama's engagement with the Middle East has been an unmitigated disaster, and his embrace of the 'Arab Spring" has not turned into a long, hot Arab Summer, with the heat being directed at American interests over a film no one has ever heard about. Absolutely, Jack. Mitt Romney may have just killed his chances of being elected president of US and being entrusted with the nation's security. His reaction to this crisis was foolish and unbecoming of what the American people expect to see in a presidential candidate. This is not the time to criticise a sitting US president. It is the time to unite the country and support President Obama's resolve to find the terrorists responsible for the tragedy in Libya and bring them to justice. Romney's actions and statements before and after his 2012 presidential candidacy make him unfit for the presidency. As much as I would like to say yes to this, there are too many poeple with a blind hatred of Obama that they will still vote for him. Even though Romney has proven how much he has no right to be president so many times. There are just to many stupid people in this country. Not with me. But he needed to be more forceful in showing what a cowed farse Obama's policies is. He as well as anyone in America has the right to critize any president and Mitt is still a private citizen. As a republican, I am ashamed. His recent behaviors has convinced me that I will not be able to vote for him. Guess I will only be able to vote in the local races this November. Though I disagree with many of the President's policies, I am an American first and support him in this difficult time. Romey's legacy will be his foreign policy and international diplomacy ineptitude. Romney, along with Palin, McCain and others continue to embarrass the United States at a time of great sensitivity on the international stage. If Romney was the diplomat that he claims to be, he would have said nothing and allowed the President, Sec. Clinton and our government to respond accordingly. Instead, his comments have done nothing but cast his insensitivity towards any chain of command. this one thing did not kill his chances. but it sure as heck did not help. it just adds to the narrative of a one issue candidate who is completely out of touch. what really hurts is that he has no new answers for the one issue he claims to know how to fix. Jack... I will make this simple.... It is possible that he did. But here's my problem. It is not only our right, but our responsibility to take or elected officials to task and question their decisions. If people question anodyne other than Obama, it is looked upon negatively..... Showing me a discriminatory response instead of the correct and right thing to do. The media is very responsible for things like this instead of support the rights of the people to question their leadership. Course once again you won't have the guts to speak this on tv. One can only hope Mitt Romney's chances of becomming President have been dimished. This is the SECOND time he has made a negative comment about our President and his Administration while an international incident was unfolding. Remember China a few months ago? Hilary Clinton was in the midst of talks about that blind chinese professor and he was, once again, running his mouth before he knew the facts. What he did yesterday was very dangerous and NOT Presidentail at all. During times of unrest everyone needs to stand behind our President, like it or not. Mitt Romney put the icing on his "unelectible cake" with his words today, Jack. This continues to show how not ready Romney is to lead the greatest country in the world. Mitt Romney needs some education on International Politics and Diplomacy. Imagine Romney and Ryan in office, it would be like 'the blinds' leading the greatest country on earth. He should take a bow for real..
Have you forgotten that in the 2008 election, then candidate Obama had questioned the leadership of President Bush regarding the escalation of the war in Iraq? Yes. He has demonstrated that he is not ready to be COC. He continues on a daily basis to make rash decisions. This is not what is needed in a Presiident. His base will still vote for him, but the unaffilated voters will not vote for him in any great number. At this point I think almost everyone has made up their minds, even though some will not admit that. I believe that he did in fact ruin his chances. What he said was acting on almost childish emotion and that will not work when you're President of the United States. If we would have reacted like that, we would be in another war, wasting more money, and as one might say "putting our economy even further in the pooper". Not only that, but insulting our standing President in time where Americans are being killed and there's even more unrest in multiple countries is childish.